If you have ever enjoyed the savory flavor of soy sauce or the rich, full flavor of Parmesan cheese, then you have experienced the taste sensation known as umami. The term “umami” was first coined in 1908 by Dr. Kikunae Ikeda to describe the unique savory taste of seaweed broth [1,2]. Although umami was initially associated only with Asian cuisines, researchers all over the world have now established umami as one of the five basic taste groups . In his original study of umami, Dr. Ikeda isolated the amino acid glutamate from dried seaweed and found that this molecule was sufficient to create a strong umami flavor . As an amino acid, glutamate is an important component of proteins and occurs naturally in all living things. When it is not incorporated into a protein, “free glutamate” can readily bind to glutamate receptors in our taste buds to trigger the umami taste sensation . 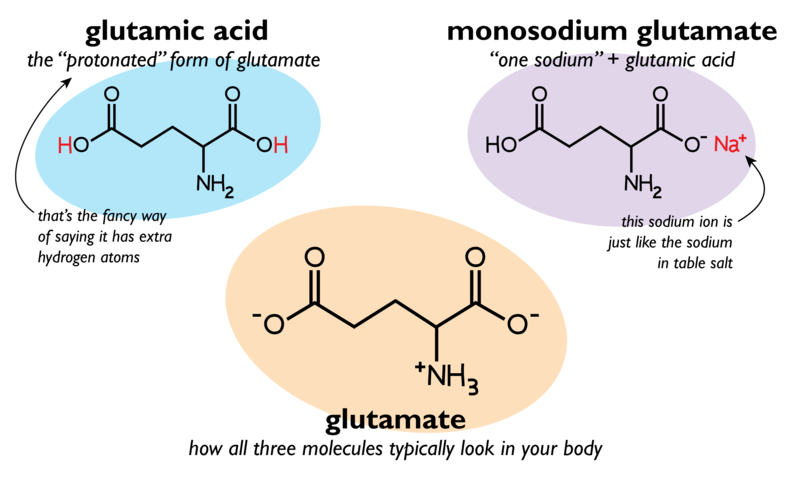 Despite their different names, glutamate, glutamic acid, and monosodium glutamate are essentially the same molecule and behave the same way in our bodies. Since the original discovery of glutamate, scientists have identified additional molecules that contribute to the umami taste sensation. The nucleotides inosine 5ʹ-monophosphate (IMP) and guanosine 5ʹ -monophosphate (GMP) are responsible for the umami taste of bonito and shiitake mushrooms, respectively . Because nucleotides make up our genetic material, molecules like IMP and GMP are ubiquitous in living organisms. 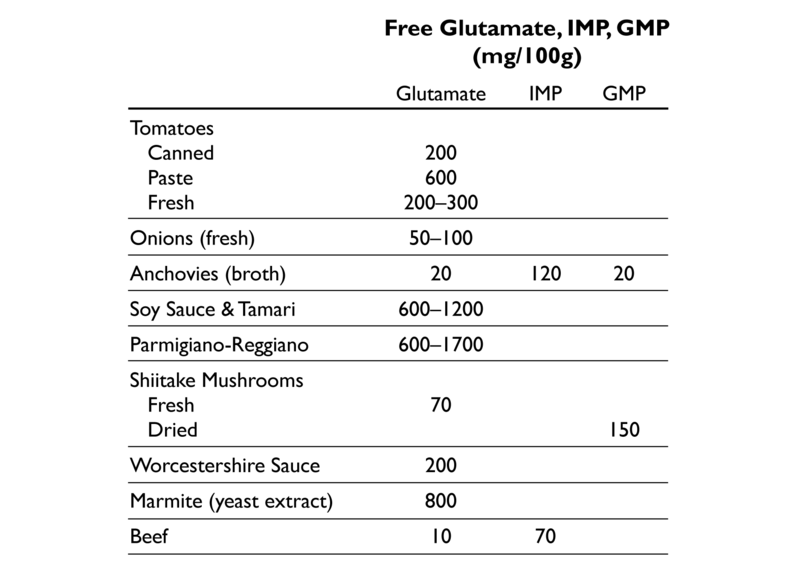 Interestingly, IMP and GMP alone do not have strong umami flavor but can synergistically enhance the umami sensation of glutamate [4,6]. Practically all living things contain the umami molecules glutamate, GMP, and IMP. Proteins are built from amino acids like glutamate, whereas the genetic molecules DNA and RNA are made up of nucleotides like GMP and IMP. 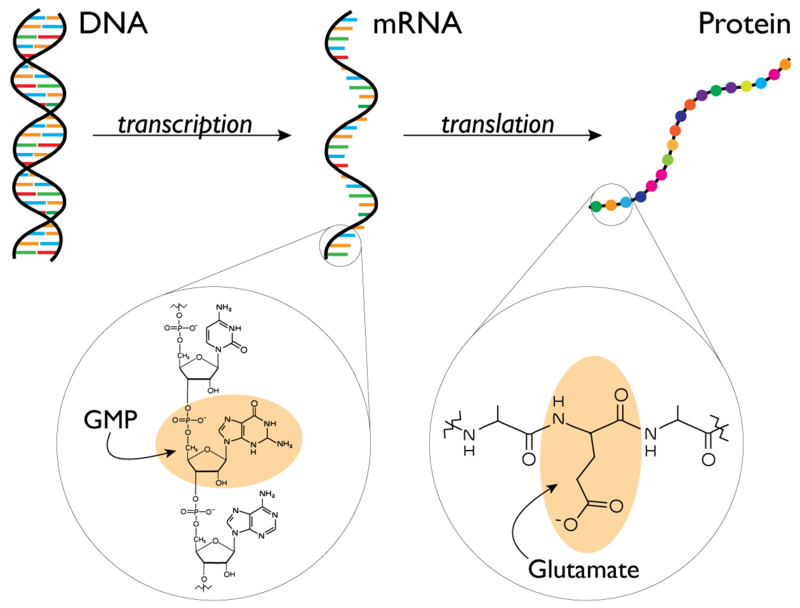 More specifically, GMP is an important component of RNA, including the “messenger RNA” (mRNA) that is transcribed from DNA and subsequently translated into proteins. IMP is not a typical component of mRNA, but is instead incorporated into other types of specialized RNA molecules like “transfer RNA” (tRNA). Free IMP can also be derived from the energy molecule ATP. Although all living things contain GMP and IMP, free GMP is found predominantly in mushrooms, while free IMP is found mainly in animal products . Although glutamate is most notoriously used as a flavor-enhancing food additive in the form of MSG, many foods naturally contain high levels of free glutamate . For example, a ripe tomato straight from the vine contains free glutamate levels similar to Worcester sauce [3,8]. Free IMP and GMP also occur naturally in many foods. Animal products like pork, chicken, and tuna are full of IMP, while GMP is most prevalent in mushrooms, yeasts, and plant-based foods [3,9]. Simple food processing techniques like fermentation, curing, and extraction can also increase natural levels of free glutamate, IMP, and GMP by breaking down proteins and genetic material [3,7]. During the production of soy sauce and many cheeses, the fermentation process breaks down soy or milk proteins, respectively, releasing many free glutamate molecules. Similarly, the cooking processes used to produce extracts like Marmite (yeast extract) break down proteins and genetic material to release free glutamate, IMP, and GMP. This recipe, originally created by Adam Fleischman, capitalizes on the umami flavor of several common natural and processed ingredients to create one insanely tasty burger. Approximate free glutamate content of Umami Burger ingredients. Approximate content of IMP and/or GMP is also reported for some ingredients. All values are reported as milligrams per 100 grams of the ingredient and are based on those reported in [3,7,8,10,11]. Purée the tomatoes with the juice from can in a blender until smooth. Cook the onion in oil in a heavy saucepan over moderate heat, stirring, until softened, about 8 minutes. Add the puréed tomatoes, tomato paste, brown sugar, vinegar, and salt and simmer, uncovered, stirring occasionally, until very thick, about 1 hour. Purée the ketchup in a blender until smooth. Chill, covered, overnight for flavors to develop. Then add the umami seasonings to taste and chill the ketchup until needed. Combine the anchovies with the remaining ingredients to taste. Blend in a mortar and pestle or, for larger quantities in a blender or food processor. Set aside. Preheat the oven to its lowest temperature setting. Stir the brown sugar, tomato paste, soy sauce, and Worcestershire sauce together; brush on the sliced tomatoes. Put the tomatoes on a line sheet pan; dry in the oven overnight. Cut the onions in half from pole to pole; peel and slice across the grain to ¼-inch thickness. Heat the butter and oil in a 12-inch nonstick skillet over high heat; when the foam subsides, stir in the salt and star anise. Add the onions and stir to coat; cook, stirring occasionally, until the onions begin to soften and release some moisture, about 5 minutes. Reduce the heat to medium and cook, stirring frequently, until the onions are deeply browned and slightly sticky, about 40 minutes longer. Preheat the oven to 375°F. Using the largest holes on a box grater, coarsely shred enough cheese to measure 1 cup. Line a large sheet pan with a nonstick liner, like Silpat. Arrange tablespoons of cheese 2 inches apart on the liner. Flatten each mound slightly with a spatula to form a 3-inch round. Bake in the middle of the oven until golden, about 10 minutes. Cool for 10 minutes on sheet on a rack; then carefully transfer each crisp with a metal spatula to a rack to cool completely. Grind the beef coarsely in a meat grinder or food processor. Put 6 ounces of meat into a 4-inch ring mold and gently tap down to form into a patty. Heat a cast iron skillet on high for 5 minutes. When it’s very hot, pour in a drop of vegetable oil to lubricate the pan. Season the patties liberally with salt and pepper. Add the patties to the skillet and sear on one side for 3 minutes; flip once and sear for 2 more minutes for medium rare. In another skillet, add half of the butter and sauté the mushroom caps for until soft, about 2 minutes. Set aside. Remove the beef patties to rest. Wipe the mushroom skillet and toast the buns cut side down with the remaining butter. Remove the buns when toasted and add spread about 2 tablespoons of the umami ketchup on both halves of the bun. Stack a beef patty with 1 tablespoon of the caramelized onions, a parmesan crisp, 2 mushroom caps and 2 slices of oven dried tomato. Serve immediately. Mosby, Ian. “‘That Won-Ton Soup Headache’: The Chinese Restaurant Syndrome, MSG and the Making of American Food, 1968-1980.” Soc Hist Med (2009) 22 (1): 133-151. Ikeda K (2002) New Seasonings. Chemical Senses 27: 847–849. doi:10.1093/chemse/27.9.847. Nakamura E (2011) One Hundred Years since the Discovery of the “Umami” Taste from Seaweed Broth by Kikunae Ikeda, who Transcended his Time. Chemistry – An Asian Journal 6: 1659–1663. doi:10.1002/asia.201000899. Yamaguchi S, Ninomiya K (2000) Umami and food palatability. J Nutr 130: 921S–6S. Li X (2002) Human receptors for sweet and umami taste. Proceedings of the National Academy of Sciences 99: 4692–4696. doi:10.1073/pnas.072090199. Kurihara K (2009) Glutamate: from discovery as a food flavor to role as a basic taste (umami). Am J Clin Nutr 90: 719S–722S. doi:10.3945/ajcn.2009.27462D. Zhang F, Klebansky B, Fine RM, Xu H, Pronin A, et al. (2008) Molecular mechanism for the umami taste synergism. Proceedings of the National Academy of Sciences 105: 20930–20934. doi:10.1073/pnas.0810174106. Ninomiya K (1998) Natural occurrence. Food Reviews International 14: 177–211. doi:10.1080/87559129809541157. Rundlett KL, Armstrong DW (1994) Evaluation of freeD-glutamate in processed foods. Chirality 6: 277–282. doi:10.1002/chir.530060410. Maga J (1995) Flavor Potentiators. Food additive toxicology. New York: M. Dekker. pp. 379–412. Skurray GR, Pucar N (1988) l-glutamic acid content of fresh and processed foods. Food Chemistry 27: 177–180. doi:10.1016/0308-8146(88)90060-X. Populin T, Moret S, Truant S, Conte L (2007) A survey on the presence of free glutamic acid in foodstuffs, with and without added monosodium glutamate. Food Chemistry 104: 1712–1717. doi:10.1016/j.foodchem.2007.03.034. Tags: adam fleischman, glutamate, glutamic acid, MSG, nucleotide, savory, taste, umami, umami burger. Bookmark the permalink.